One of Roberto Bolaño’s distinctions as a writer is his particular way of running a narrative off the rails. My favorite example is Distant Star, the story of how sinister Chilean poet Carlos Weider quietly slips into the role of state-sponsored propagandist and executioner. Even as this substantial change is occurring, another more fundamental one happens: the narrative frame hiccups from post-coup Chile to 1980s Spain, where the book becomes a search for the now long-lost Weider that revolves around a classic “locked room” detective mystery. The pleasure evoked by Distant Star‘s cracked structure is one common to Bolaño: the reader must fit together two parts that are clearly linked, albeit via a murky logic. Bolaño’s mastery of this form allowed him to maintain a strong sense of narrative momentum and focus, even while traversing large amounts of space and time. Moreover, it allowed him to force a reader to think about the intersections of art, passion, and politics, without becoming pedantic or preachy. The newest of Bolaño’s novels to be translated, The Third Reich, is a fine example of how his narratives slowly collect details until they have shifted into something that defies expectations. Never published in Bolaño’s lifetime, the book has been dated to 1989, which places it well before Bolaño’s staggering era of productivity, beginning in 1996 with Nazi Literature in the Americas and concluding five novels later with the thousand-page 2666, finished just before his death in 2003. Although Bolaño’s friend Bruno Montané once heard the author call The Third Reich a “failed project,” there is evidence to the contrary: at the time of his death, Bolaño had typed up its first sixty pages, as he did with the entirety of his prior “trunked” manuscripts Antwerp and Monsieur Pain, which were published within his lifetime at his discretion. The Third Reich is one of Bolaño’s most European novels, as it follows the clash of cultures that occurs when four German tourists travel to Spain’s Costa Brava. Told as a series of journal entries by one of the tourists, Udo Berger, it narrates his partial transformation in the face of horror. This is hardly an uncommon theme for Bolaño — if anything, it is the single theme that Bolaño most clearly owned — but The Third Reich plays it differently enough to make a valuable contribution to his oeuvre. It is distinguished by its expertly handled portraits of a large cast of major characters, as well as Bolaño’s ability to orchestrate the increasingly complex and bizarre relationships among them with a sureness that keeps the plot ticking even as his subtext continues to broaden in interesting ways. The book gets off to a placid enough beginning as Udo, in his mid-twenties, looks forward to a fulfilling life as he leaves young adulthood — of course, this situation will not last for long. The first crack comes when Bolaño reveals that Udo is a devotee of a tabletop strategy game called The Third Reich, wherein players re-wage the conflicts in World War II’s European Theater with counters representing real-world military units. He is the German champion, that is, the recognized top player among a subculture of zealots who meet for tournaments, publish new gambits in low-budget ‘zines, and generally gossip about one another. Udo’s pursuit of The Third Reich sounds much like how Bolaño described the pursuit of literature: something is done around one’s professional life, an activity for which Udo’s passion is so great that he has significant misgivings about doing it “professionally.” It is, in so many words, a calling. And, to paraphrase something Bolaño once said about literature, it turns out to be a dangerous calling for Udo. The first third of The Third Reich deftly lays out the relationships between Udo and his girlfriend, Ingeborg, and their friends Charly and Hannah. Bolaño also introduces a couple of baleful Spanish beach bums known only as the Wolf and the Lamb, plus a very strange, very muscular transient who rents pedal boats; the latter is known as El Quemado because awful burns of unknown origin cover much of his body. Even as the Germans (with the Wolf and the Lamb mooching free drinks along the way) do nothing much more portentous than get drunk in clubs and sunbathe, Bolaño draws on his trademark capacity for infusing the everyday with an unpinnable sense of menace. Charly’s strange behavior appears to be bringing the Europeans toward some kind of an incident when, without warning, Bolaño interrupts with an entirely unexpected catastrophe: while windsurfing, Charly is lost at sea. With surprising suddenness the summer vacation is undone: Hannah heads back to Germany, Ingeborg follows, and Udo is left secluded in the hotel. Only then did El Quemado smile, without diverting his attention for long from the pedal boat still lost in the distance. A slight shiver ran through me. The flesh of his cheek, two or three poorly healed scars, bristles, and for a second I was afraid that with this optical effect — there was nothing else it could be — he could hypnotize me and ruin my life forever. I was rescued by El Quemado’s own voice. As if speaking from an insurmountable distance, he said: do you think we get along well? I nodded several times, happy to be able to escape the spell cast by his deformed cheek. As Udo and El Quemado become embroiled in an epic game of The Third Reich, which Udo teaches to El Quemado as though taking on a surprisingly precocious pupil, the entire feel of the resort town changes. The August high season gives way to a lazy September, and locals like El Quemado, the Lamb and the Wolf, and hotel manager Frau Else, with whom Udo has been carrying on a low-key seduction the entire time, become slanted versions of the characters we met in the book’s opening chapters. Obsessed with the sense of void he finds in El Quemado, Udo virtually forgets his prior life. 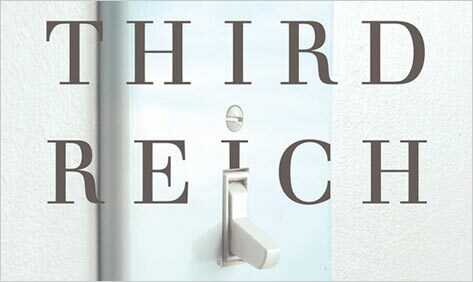 From here on The Third Reich, too, takes on a second life, becoming a book similar to but markedly different from the one we have been reading. What Bolaño most powerfully achieves here is a sense of profound instability as the characters continually redevelop anew. Udo’s relationship with El Quemado is particularly rich: he goes from regarding El Quemado dismissively — at most as an object of idle curiosity — into something powerful and disturbing. At length, The Third Reich comes to look like an experiment formed from bringing forth certain repressed characteristics in Udo, El Quemado, Charly, and others. Notably, these characteristics are activated when individuals are brought into contact with The Third Reich board game. The long-coming climax to Udo and El Quemado’s book-length confrontation feels pale in comparison to similarly situated visions of horror in Distant Star or By Night in Chile, but I find that not to be so much a failure of Bolaño’s imagination as an aspect of the story he is telling. After the confrontation, Udo references Goethe’s poem “Blessed Longing,” half-quoting the closing lines: “And until you have possessed / dying and rebirth / you are but a sullen guest / on the gloomy earth.” That Udo describes himself as a “sullen guest” implies that his experiences with The Third Reich are not transformative, that he is not suited to travel that last bit into revelation. But witnessing the arc of his descent nevertheless imparts a bracing chill.